Shadowland is over and the street level heroes pick up the pieces in Marvel's December solicitations, surrounded by more Cap and Thor books then a Chrissy stocking can handle. These four December cover art highlights, have just the right mix of naughty and nice. MARVEL COVER OF THE MONTH: Namor: The First Mutant #5 - Mike Mayhew This cover just has a great retro vibe that makes me think of classic pulp comics. I mean it's Namor saving yon helpless damsel during the war - it's as 'retro' as you get! 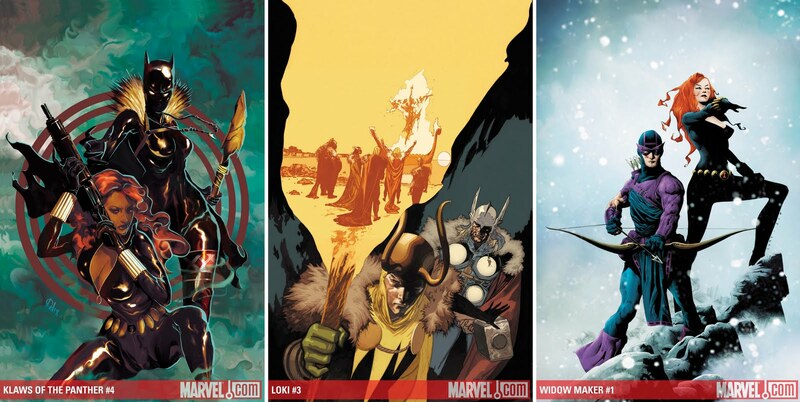 CLOSE CONTENDERS: Mike Del Mundo - Klaws of the Panther #4 (of 4), Travel Foreman - Loki #3 (of 4), and Jae Lee - Widowmaker #1 (Anyone would think I had a thing for Black Widow)! That Namor cover is great.